This painting is also referred to as The Incredulity of Saint Thomas. Thomas was one of the Twelve Apostles. He appears in the Gospel of John, most famously in the passage John 20: 24-9, where the saint doubts the resurrection of Christ, saying "Unless I see the nail marks in his hands and put my finger where the nails were, and put my hand into his side, I will not believe it." Jesus then comes to him a week later and invites him to do just that. After Thomas incredulously poked the Lord's wounds, he believed in the Resurrection and called "My Lord and my God!" Jesus responded, "Because you have seen me, you have believed; blessed are those who have not seen and yet have believed." 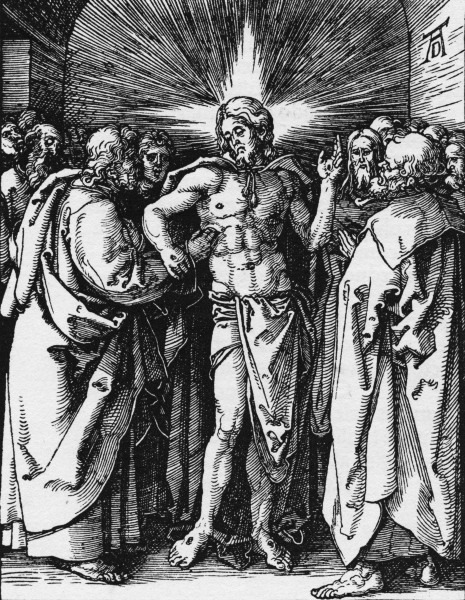 Even today, someone who is obstinately skeptical and demanding of empirical proof is referred to as a "doubting Thomas. " Doubting Thomas was painted for the Marchese Vincenzo Giustiniani around 1601-2, and is thus contemporary to the scenes from the life of Saint Matthew Caravaggio painted for the Contarelli chapel around 1600. Art historians have identified yet another case of Caravaggio's paintings evidencing an influence from another artist, despite his protestations that he painted only from nature. 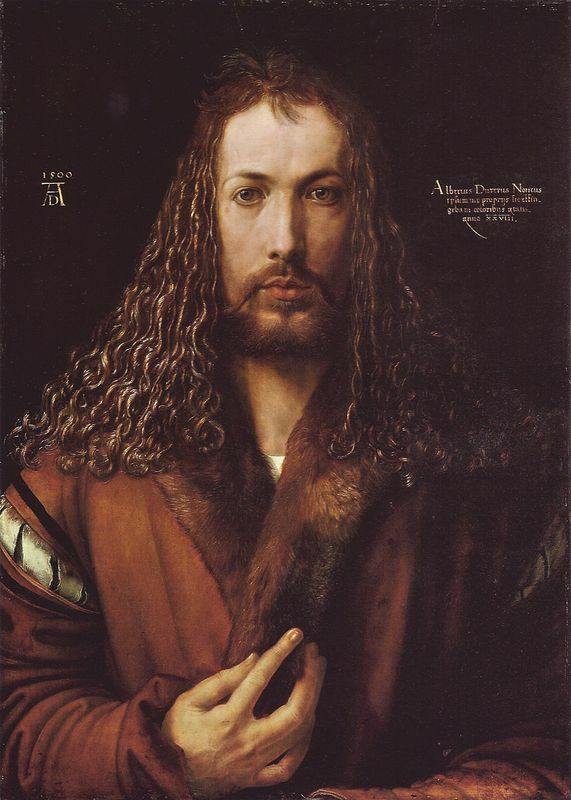 According to the landmark art historian Walter Friedlaender, Caravaggio's emphasis on Christ guiding Thomas's hand into his wound has stylistic affinities with Northern prints of the same subject, such as the one by Dürer. Jesus and the apostles are tightly arranged, with Jesus and Thomas at the forefront of the image. It seems that Thomas' disbelief deeply affected Caravaggio and few of his works depict this physical rendering. Doubting Thomas' classical composition carefully unites the four heads as they seek the truth. This picture is similar to the Martyrdom of St Matthew in that the same model reappears as the apostle at the head of this composition. Caravaggio's painstaking attention to verristic detail, for example, the realistically rendered ripped seam on the shoulder of Thomas's garment in this piece sets his apart from his contemporaries. 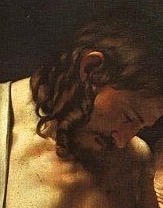 He depicts marks on Jesus' chest and one can see Thomas's dirty fingernails very clearly. Although this was a popular subject throughout the Renaissance and Baroque, Caravaggio's gory emphasis on Thomas's ruddy fingers sticking into Christ's wound and displacing the surrounding skin is a first. Light streams into the image from the left hand side. Jesus is bathed in light and his white skin and robes also make his stand out. Thomas position in the canvas is reinforced by his red clothing and the light shining on it. David Hockney claims that in this painting, Caravaggio must have traced using a camera obscura because none of the figures seem to be looking at the wound on Christ. However, many critics dispute this. Caravaggio's Doubting Thomas was a hugely popular painting and 22 copies were made in the 17th century alone. It is a known fact that Caravaggio often made several copies of his own paintings. 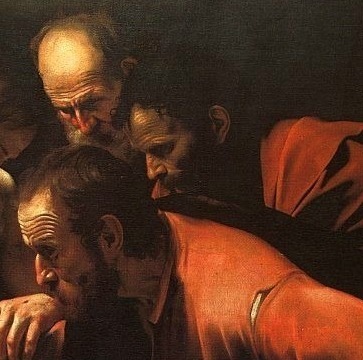 In 1999, Doubting Thomas and Supper at Emmaus bearing close resemblance to original versions by Caravaggio were discovered in a church in the small French town of Loches. Both works bear the coat of arms of one Philippe de Bethune, the French ambassador to Rome from 1601-1605, who acquired four of Caravaggios' works during his stay in Italy. 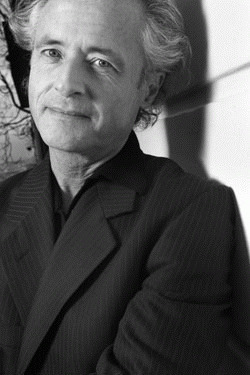 Historical novelist José Frèches spent seven years authenticating the two canvases found at Loches and declared them to be the work of Caravaggio. 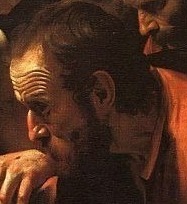 Frèches proposed that technical analyses showed that the type of canvas and pigments used in the works were exactly the same as other Caravaggio paintings. In 2006, the two paintings were declared as original Caravaggio's and put on display. Yet, due to the lack of real evidence and major stylistic discrepancies, many art historians dismiss the Loches works as 17th century copies. Former Louvre Pierre Rosenberg describes the works as mere "good copies. " 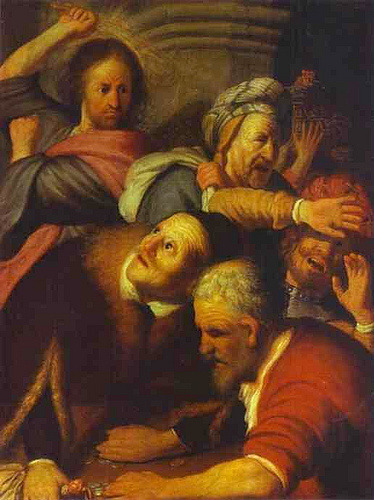 Doubting Thomas was painted for the Marchese Vincenzo Giustiniani around 1601-2. In 1815, it was acquired by the Kaiser Freidrich Museum in Berlin, and today resides in Sanssouci, Potsdam. Caravaggio produced many religious works during his short career and his offerings were new and raw. His talent shone through in these works and cardinals, noblemen and religious authorities overcame the shocking newness of his paintings and were moved and enchanted by what they saw. Caravaggio ignored the rules that artists from the previous century had followed and instead developed a love of realism and his emotional directness was unrivalled. Caravaggio's paintings constitute some of the most stunning works in the entire history of Western art. Observing the evolution of his style from his early works to his last paintings is a chronicle of his life. 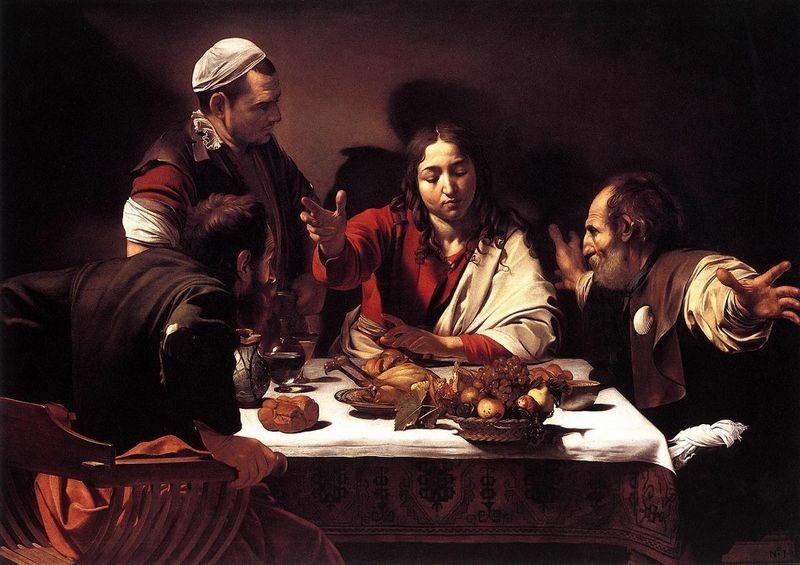 Caravaggio played a key role in defining 17th century Italian art. In the 20th century when emerging artists were adopting his techniques and imitating his style. Caravaggism had profound effects on the art world and artists that were directly and indirectly influenced by Caravaggio include Rubens, Hals, Rembrandt, Vermeer, Velazquez and Bernini. The Baroque style originated in Italy and its pioneers include great artists such as Michelangelo and Tintoretto. 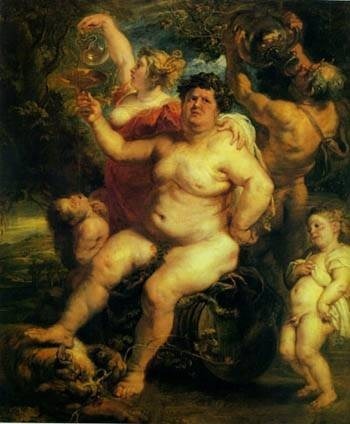 Baroque art focused on impersonal and generic works with an animated and energetic mood. The success of this art genre was promoted by the Roman Catholic Church and the aristocracy, the latter of which saw Baroque art as a means of demonstrating wealth and power. Caravaggio is a pioneer of the Italian Baroque style that grew out of the ruins of Mannerism. At the end of the 16th century, the artist was exposed both to the artistic reforms of the Counter-Reformation as well as to a new interest in scientific naturalism flourishing in northern Italy, due in part to the influx of artworks from northern Europe. Out of this context, Caravaggio developed a style of unflinching realism, unprecedented approachability and a direct appeal to the emotions that had no equal among his peers and helped to mould 17th century Italian art. Italian Baroque art was not widely different to Italian Renaissance painting but the color palette was richer and darker and the theme of religion was more popular. There remains some mystery surrounding the true derivation of Italian Baroque but some argue that the word 'Baroque' comes from the Italian "Barocco". Caravaggio's influence is evident both directly or indirectly in the paintings artist such as of Rubens, Bernini, Jusepe de Ribera and Rembrandt, and the next generation of artists profoundly influence by Caravaggio were labeled the "Caravaggisti" or "Caravagesques", as well as Tenebrists or "Tenebrosi" ("shadowists"). Bernard Berenson agreed: "With the exception of Michelangelo, no other Italian painter exercised so great an influence".